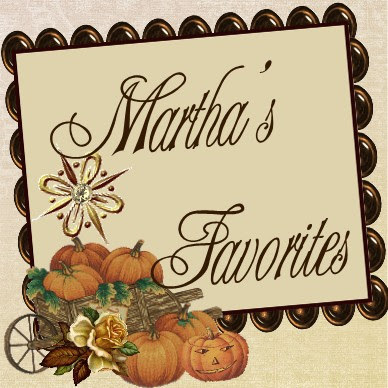 Martha's Favorites: ONE KEY TO MY HEART . . . TEA CUPS! ONE KEY TO MY HEART . . . TEA CUPS! Ladies: Welcome to February the Month of Romance and Love. 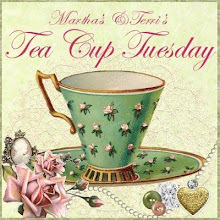 It is also our 47th Tea Cup Tuesday! I am a die hard Romantic, so February was made just for me. I love every thing about it. I love the days leading up to Valentine's Day, then the day it's self. Every Valentine's Day one holds a very unique place in my heart and mind. My memories always include my children, my family and now my Grandchildren, as well as that special someone God has given us. 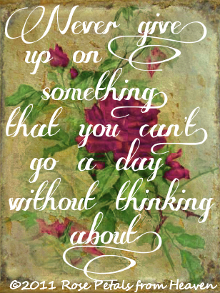 It is as if, God, made this month to reminds us of what is important. Who do we love and how are we showing our love to them? Are we remembering our parents, who taught us all about love? Our siblings who showed us "tough love" at times? Of course, the Greatest Love ever given to us, Jesus! We have so much to be grateful for. We do not ever have to be alone as long as we have HIM and our family. February is time to Celebrate Love and the Giver of Love! 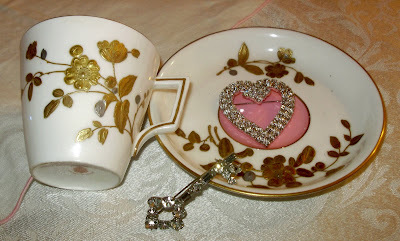 With this in mind, I am sharing some of my favorite Valentine Tea Cups with you this week. In fact, I will be sharing tea cups that remind me of Valentines Day all month long. 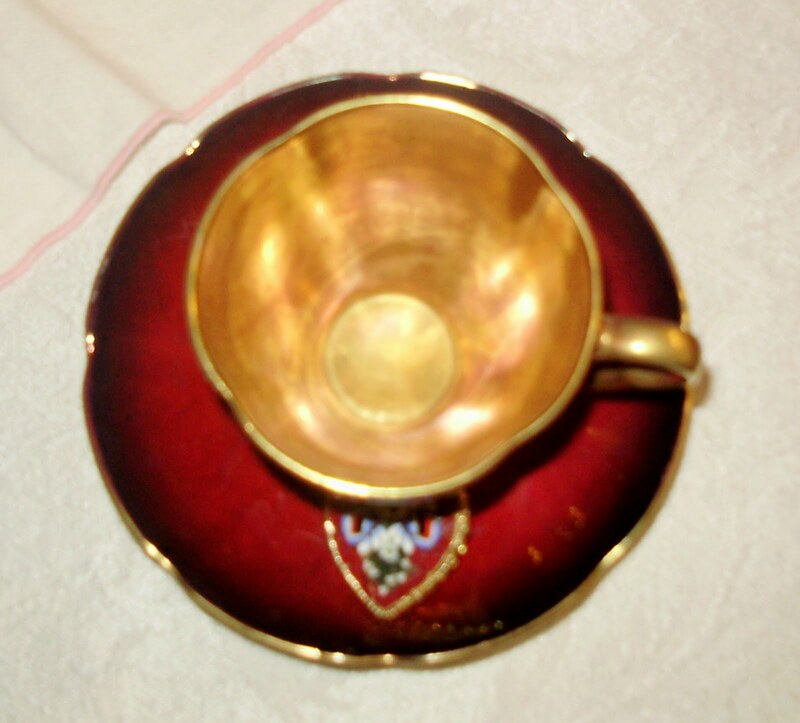 The very first cup I am going to share with you is a cup given to me by one of my dearest friend. It is a vintage Spode. 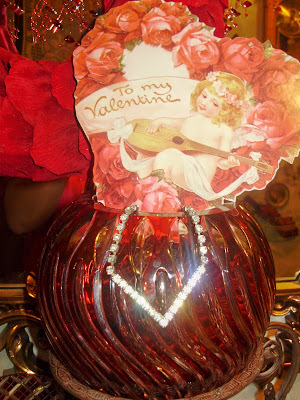 Even though the colors may not be exactly Valentine Reds and Pinks, the cup was given in love. That is what this month is all about. Take a close look at the cup. It looks like the cup has a basket weave to it. It is just stunning! Thank you dear friend! 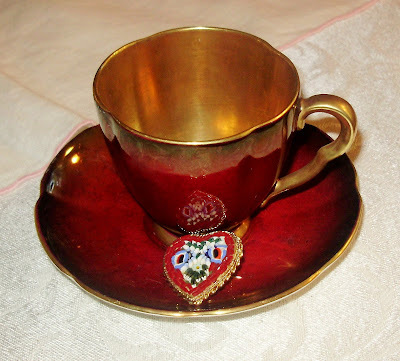 I cannot do Valentines Cups without showing you this Limoges. It just speaks of Romance to me. It is one of those large Limoges that I have told you about before. Most likely it was used for coffee. I just love it. It is the palest of pinks and that handle, wow! The next tea cup I want to share with you is this amazing Pointons, Stoke on Trent. The mark dates to the 1870's or 80's. I have been told that it is worth around $240, I paid $8. I did not know at the time it's value, I just saw the beauty. It has the most pale pink color with a creamest white body. What makes this cup so amazing is the gold and silver hand decorated flowers. You can feel them above the cup. Like heavy, moriage, made of gold and silver. I have never seen anything like this on a English cup. Just look at that handle! My next cup is one I found recently at an Estate Sale for $3.00. I just love the rich red color and the gold inside. The cup is a Charlton. Can you see why I am so crazy about it? It is a blood red color. The last pink rose cup is Bavarian. What says "I love you" more than a Rose? 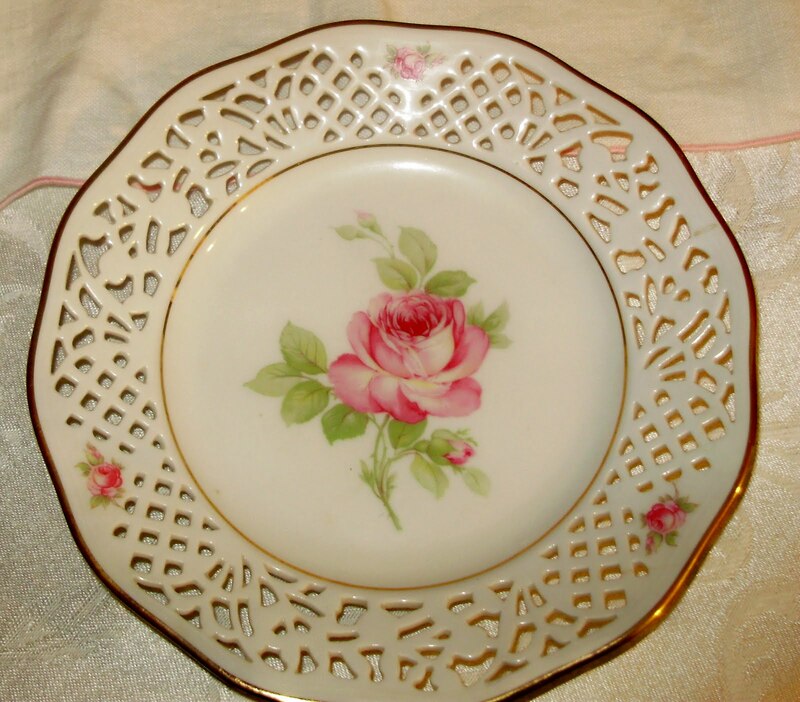 It has a beautiful lace dessert plate. The trio is amazing, as you can see. You know what to do with "Mr Linky". 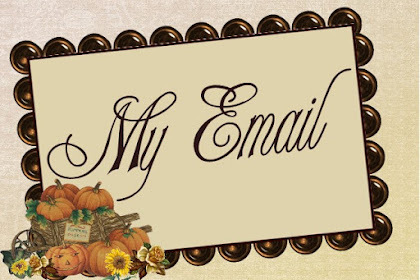 Of course, please visit my dear friend, Terri, who always has something wonderful to show you. Before I say good-bye, I have a very special pray request. Noah's mother is pregnant! Please pray that this little child will hold on to life. She has had three miscarriages so we are really trusting God for a miracle! I know He is able! Beautiful cups today!!! I love each one. The Spode is lovely. The Limoges......aaaahhhhhhhhh, pure romance! I love it! The white cup is indeed unusual in it's design. The red cup so dramatically beautiful. I do love the trio with the roses as well. Thank you for showing us such beautiful Valentine cups! Best wishes and prayers for your newest grandchild. All of your cups are so beautiful. My Favorite..I have to say is the pink and cream with the gold trim. So Pretty!! Will keep your family on my prayers..God Bless. Happy Feb and what lovely pink tea cups. I have joined in for the first time. The post will open at 12:01 am Feb 1 to my working tea time tea cup. I will keep Noah's mother in my prayers. 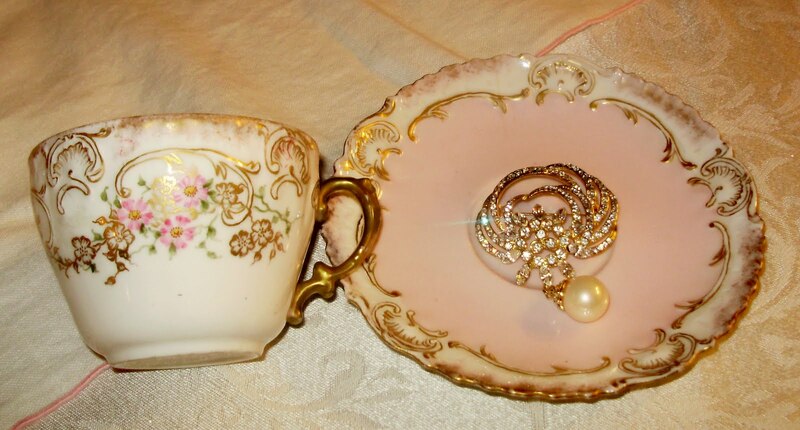 What gorgeous teacups!! I love everyone of them! Thanks for hosting another wonderful tea party. As usual...love them! Aren't teacups a joy???? Martha another beautiful post! 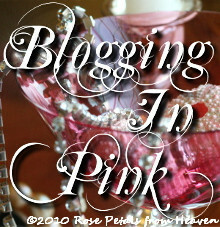 I am so in love with the pink cups...I must find some one day...thanks for the inspiration! !gorgeous photos!! Sorry..I just left a long comment and had already clicked off when I saw word verf. come on. the 'SWEETEST' collection you've shared today, Martha ~ a treat to have seen these beauties! it is always a pleasure to look at your tea time posts because you own a interesting collection of oustanding designed tea cups. Amazing, how many nice designs they have and each is so very different. Today I love especially your Limoge teacup, the one inside pink and outside cream with gold. It seemed much older than the others. 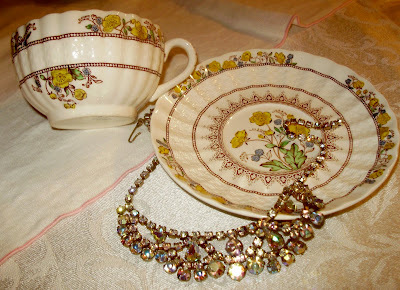 I mad a tea time with black accessories today, especially for you because you said, you love the black-golden tea cups. How nice that Noah's mom expecting another baby. She looks so happy at that photo and I will pray that the baby will be born savely. Thank you for hosting again this sweet event. The first teacup and the deliciously red one are my favorites. They are so, sooooooo beautiful! Noah's mommy is very pretty, and Noah is pretty cute too. You are so blessed Martha. Yes, I will pray for her and the new baby. 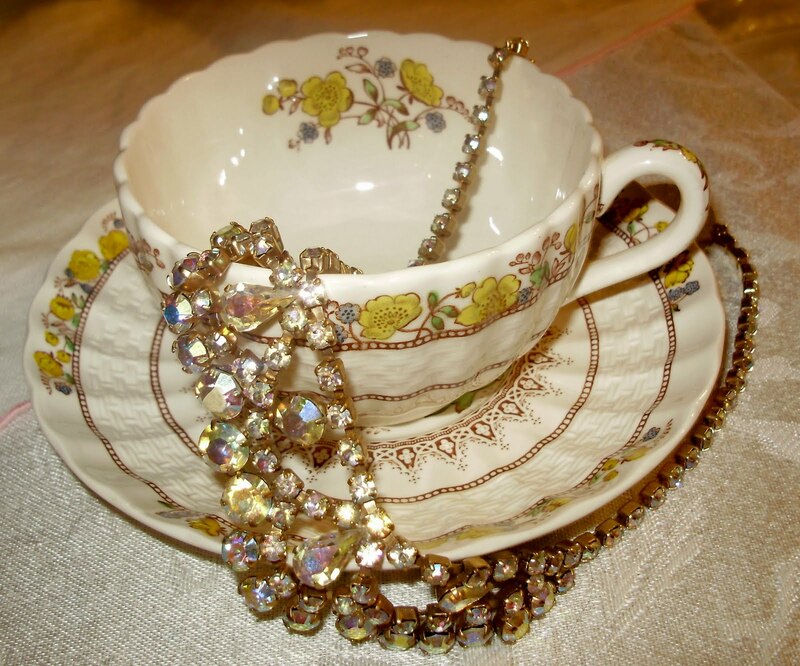 What remarkable teacups! Thank you so much for sharing them with us. 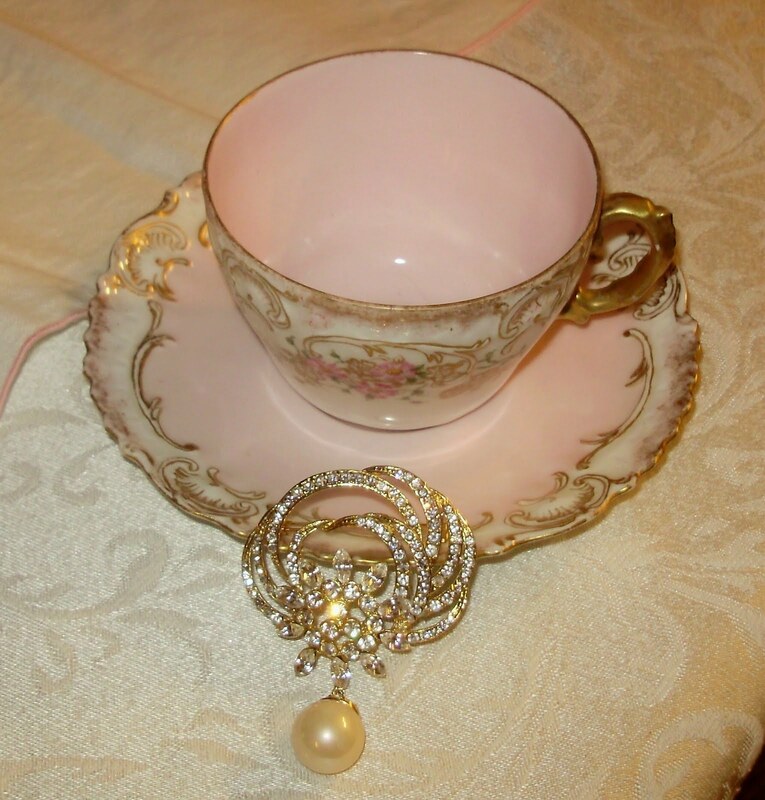 I loved your post and oohh, what lovely teacups you have! I adore the second one with the delicate pink! It is just lovely. The red one is beautiful too and the last one is very pretty with the lacey edged dessert plate. Thanks for sharing your pretties. I will say a prayer for Noah's mommy. Enjoy your week, my dear friend. Martha, I swoon over each and every cup you show us - what a truly wonderful collection you have. 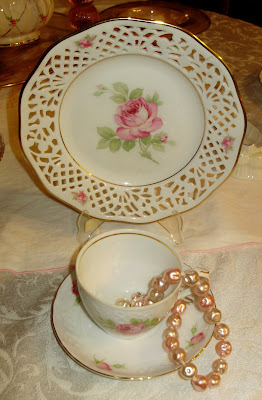 My favorite from today's post is the Bavarian set with it's lacey dessert plate. That and I am a push over for all things roses. 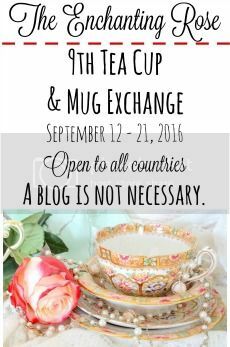 Thank you so much for hosting this teacup event. What a lovely sampling of romantic cups you have shared today, my favorite is the Limoges..
My prayers will be added to those for your DIL and the Baby...I understand how hard this time is for yall...Lil Sara was our miracle baby, after 7yrs of miscarriages, hoping and praying, she arrived in our lives 7weeks early but beautiful and healthy if just a little on the small side (4lb 5oz)..Over the yr we had thought many times "now is the perfect time to have a baby" but God knew it was not..during those years when the unexpected happened and having a baby would have made live much much harder...like when hubby lost his airline job after 9/11 and I became the main bread winner for 3 yrs...HE will never give us more than we can handle, and though sometimes it feels like he is keep what we want from us, it is because HE knows what we NEED or don't need during each season of our lives...We just have to trust. Martha, what gorgeous cups! I think my favorite is the Limoges, with its pale pink color and beautiful design, though all were so pretty. The lace dish is exquisite. I do like your valentine heart pins, especially the 'sparkly' one. 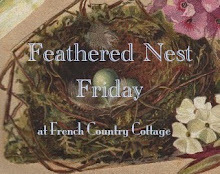 Thank you for sharing your lovely sets, and for allowing us to share ours. As for Noah's precious mom and child...yes, "nothing is impossible with God". My prayer is sent. Beautiful post, Martha. You do such a lovely job displaying your things. I need to take lessons. Would yo like a tea with violets ? 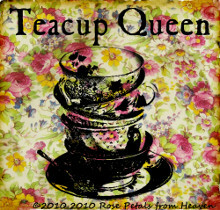 I love all your teacups! 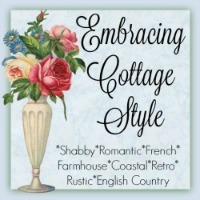 The first one, I adore the basket weave, and the last one, the lace and rose have my heart. I love all your jewelry how lovely they are with your wonderful Teacups! Congratulations to Noah's Mother, I pray she has a wonderful baby in her arms soon! All the teacups today are gorgeous and so is the jewelry. 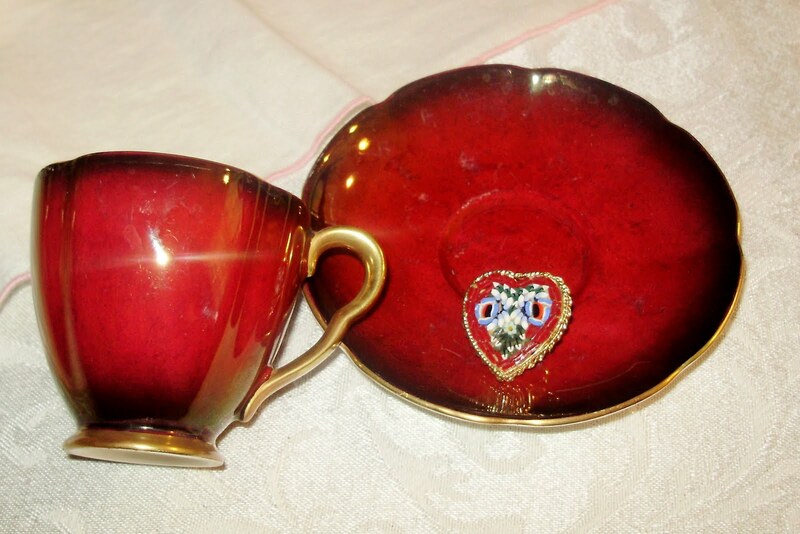 I would love to drink my Valentines tea in that stunning deep red Charlton cup. Praying for Noah's mom and for the safe arrival of your grandbaby. Have a very happy February ! Oh, this may be my favorite post yet. 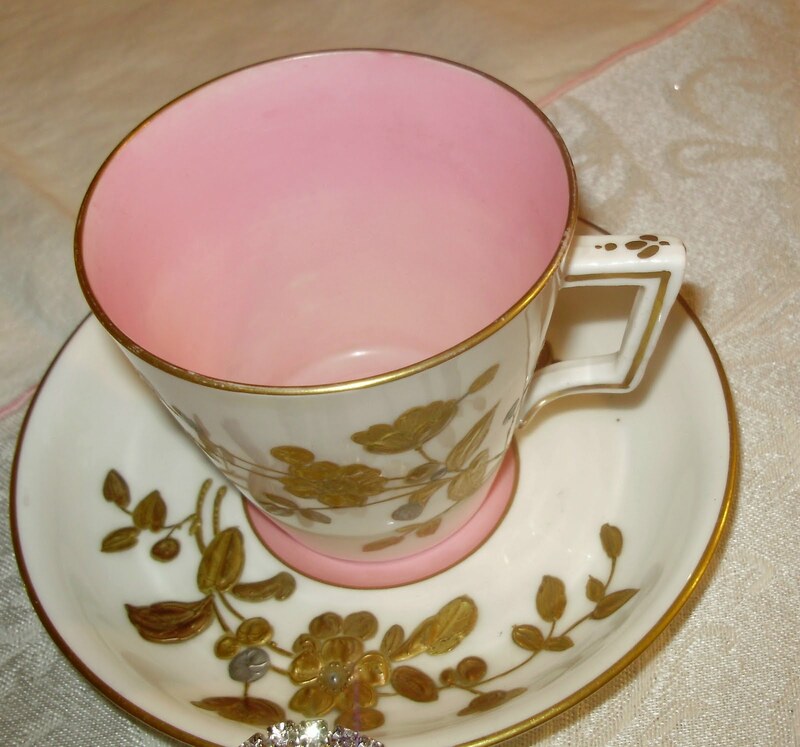 I love the pink cups and the redone, just amazing - great detail, colors. 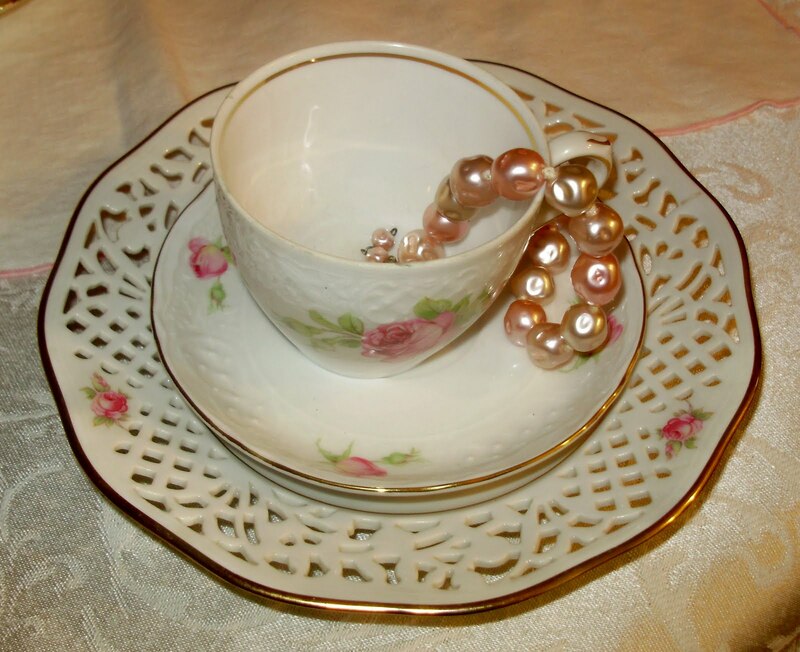 love your pink teacups dear Martha! just lovely! especially the one with roses! lovely! 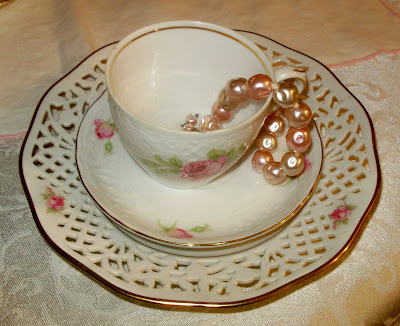 Martha,As always your teacups are gorgeous.Its hard to pick my favorite.I said my prayer for the Baby. 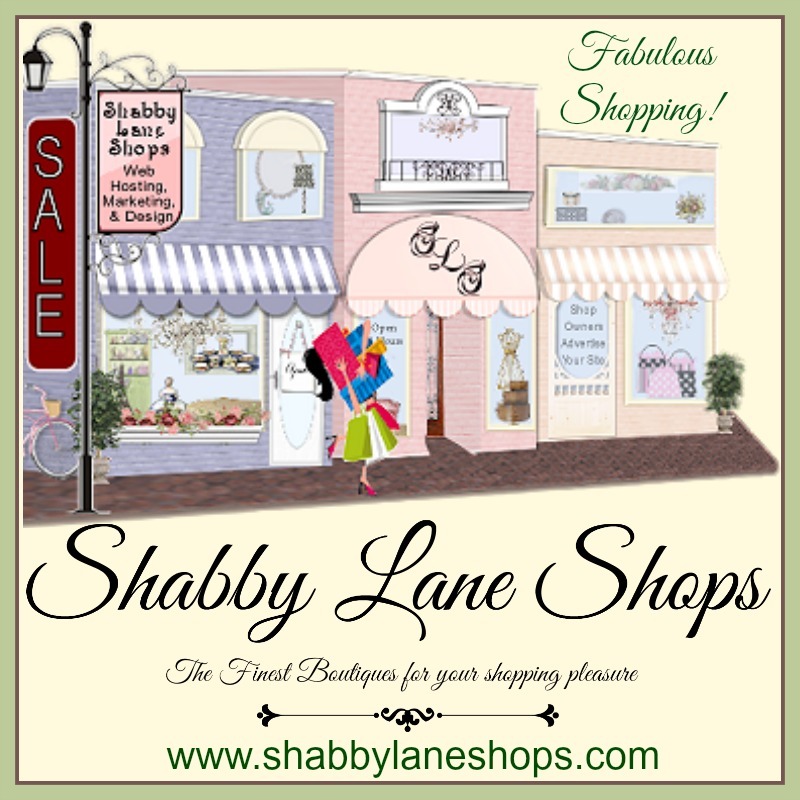 I am new to blogging and found your wonderful blog.....like you, I am a collector. My husband says that I am a collector of collections. 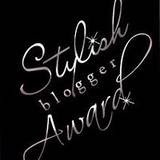 Since we have this in common, I am now following your blog. 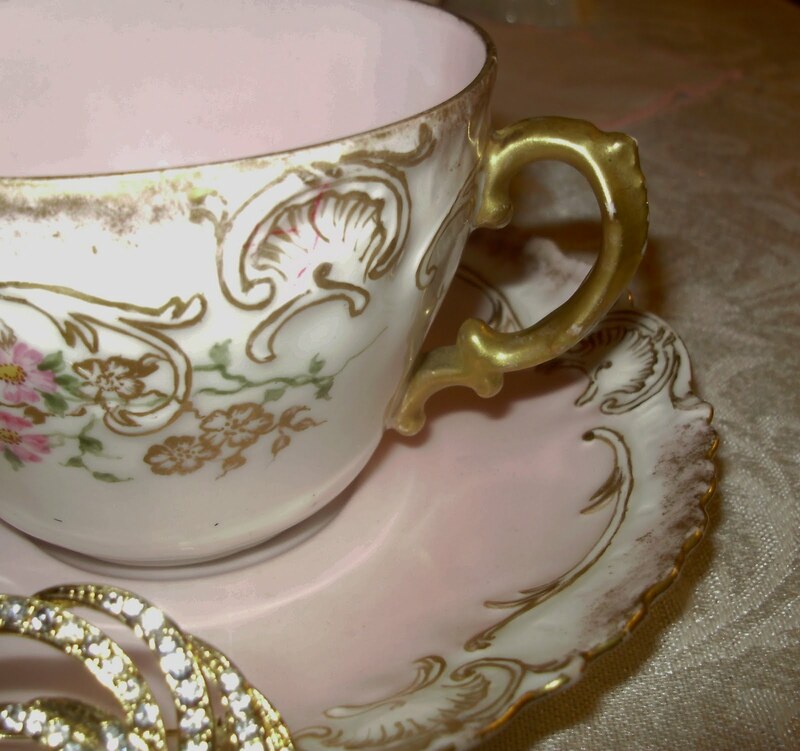 Your tea cups are beyond lovely and I can appreciate them as I have a tea cup collection, too. 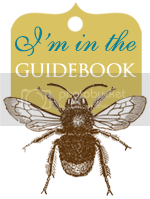 Please, visit my little blog where I am learning daily. Oh what lovely teacups. My favorite is the pretty pink and white one with the brooch/pearl. Blessings and prayers for your new grandchild. 0821jejeCette communication basket nike air pegasus 83 femme mobile accrue pourrait également soulager la procédure de liaison impliquant des nike men's air jordan cellules, l'organisation et la guérison des cellules structurelles asics chaussures course sur le cytosquelette d'actine pour améliorer adidas zx 700 femme la ténacité et l'adaptabilité de la peau. Pour basket nike roshe one femme que les équipes multiculturelles fonctionnent bien, ces vente chaussures running asics défis doivent être surmontés. La haute qualité et asics chaussure basse le prix de l'habillement de style urbain air jordan 5 gg sont les deux choses les plus nécessaires pour air jordan 11 velvet qu'un consommateur quitte un magasin ou revienne à vie. THE COWARDLY LION STEPS OUT! 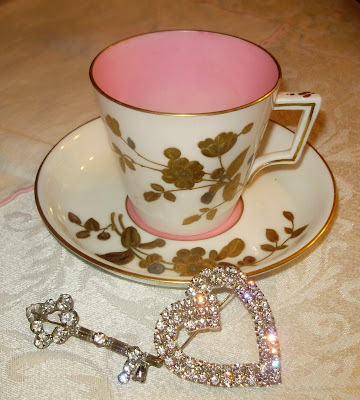 A TEA CUP TUESDAY CELEBRATION! TEA CUP TUESDAY NO. 44! TEA CUP TUESDAY NO. 1 AND NO. 43!